*You are welcome to submit ONE nomination in each category. You may only submit ONE nomination per category. Anyone who makes more than one submission in any one category will have all of their submissions in that category deleted. * A special forum will be opened on The Sweet Spot at http://thesweetspot.forumotion.net for the submission of nominations. Nominations may be submitted today through Feb. 11, 2012.
not have to plan to attend the RRRoundup to make a nomination or to win a category. 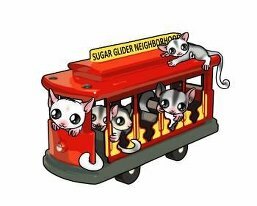 * Within 3 days of the submission deadline, a committee of 2-3 people who do not own sugar gliders (identities to be revealed at the RRRoundup) will review each category and narrow the nominations down to the top 4 submissions in each category. * In order to ensure that votes are counted accurately, the votes will be tallied by three individuals at the RRRoundu. The three individuals will include at least one SUGAR Group staff member and at least one person who is not on staff with the SUGAR Group. Votes will be tallied on Thursday, March 15, 2012. * Winners of the categories will be announced at dinner on Friday night, March 16, 2012. All paid registrants for the RRRoundup (including those who are participating online) will have access to view the dinner and winner announcements. * Last year's winning photos are not eligible for submission. Bring on your nominations! You only have until Feb. 10 to get them to us!!! !